War-date Autograph Letter Signed “N.B. Porter, President of the Senate” 1pp. 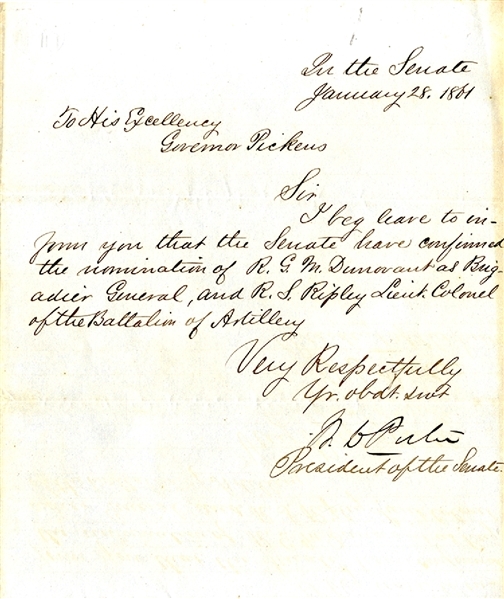 quarto, January 28, 1861, addressed to Governor Pickens of South Carolina, and reads “ I beg leave to inform you that the Senate have confirmed the nominations of R.G.M. Dunovant as Brigadier General and R.S. Ripley Lieut Colonel of the Battalion of Artillery.” Fine condition.